Nokia Video Converter Factory Pro is a professional video program for you to enjoy the multimedia on all of Nokia cell phones. It supports convert all video formats to MP4, 3GP, FLV, WMV, AVI video formats and AAC, MP3, WMA, WAV audio formats. It also allow you merge, cut, crop video/audio files and offer lot of video effects like mosaic, blue, noise, etc. The 3.0 edition is a revolutionary new way of Nokia video conversion. We have configured over 100 Nokia phones video format into the program, such as Nokia N8, Nokia N97, Nokia X6, Nokia X3, Nokia E7, Nokia E73, Nokia E62, Nokia 5800, Nokia 5530, ect (Check all supported models). You don't need have to figure out what is the right video format, resolution, encoder, frame rate for your Nokia phone, just select right model for your Nokia phone, that is it, simple enough for everyone. 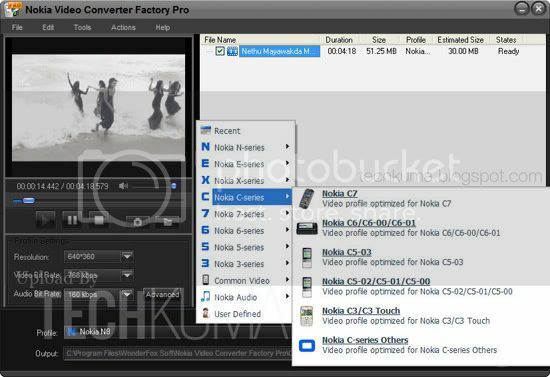 Nokia Video Converter Factory Pro is easy, fast, reliable, safe, and loaded with features, it is an all-in-one video converter for your Nokia phone. When you want to see your favorite video or movie on your Nokia phone. When you want to listen to your favorite music on your Nokia phone. When you want to convert FLV format so that you can deliver your personal videos on the website. With Nokia Video Converter Factory Pro, you can do the tasks above easily!